QUEENS, N.Y. – Coming off of a preseason that saw the St. John’s University women win both their matches, the Red Storm campaign at No. 25 Tennessee in Knoxville to kick off its season Thursday at 7 p.m. The first match between the Red Storm and the Volunteers will be available to live stream on WatchESPN. The winningest coach in St. John’s women’s soccer history, Ian Stone begins his 25th season. Stone has helped the Johnnies to 17 postseason tournament appearances and three NCAA Division I Tournament berths (2009, 2013, 2015). 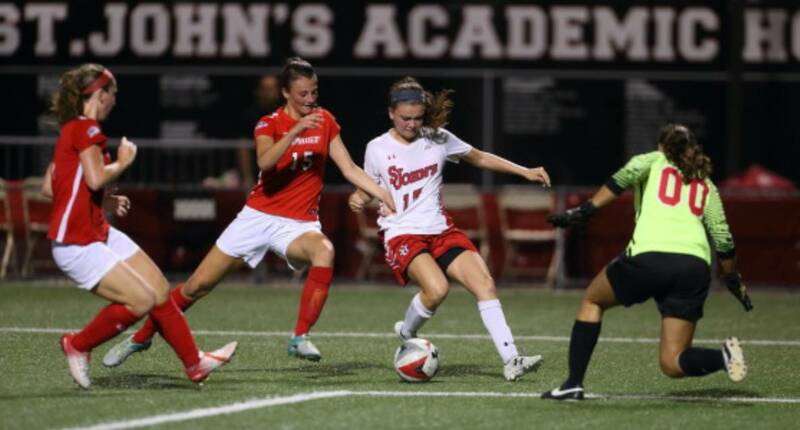 St. John’s enters the season sporting a strong group of returning talent, including second team All-Big East selection and preseason All-Big East honoree Christina Bellero. The senior registered a team-high 17 points last fall, tallying a team-high seven goals to pace the squad and tie for eighth in the conference. Her 48 shots were a team best with 30 on target. Bellero also dished out three assists, second most on the team. The Johnnies welcome back another 2017 All-Big East selection in Maia Cabrera. The sophomore earned a spot on the conference All-Freshman Team in which the Rego Park, N.Y. native recorded 23 shots for the third most on the squad. The Volunteers enter the new season on the heels of an impressive campaign that saw the team go 15-4-2, advancing to the second round of the NCAA Division I Tournament before falling to Washington State in a shootout. The Vols return five All-Southeast Conference performers to the pitch, including three first team selections in Katie Cousins, Maya Neal and Khadija Shaw. Anna Bialczak picked up second team all-conference accolades, while Erin Gilroy was named to the SEC All-Freshman team. Tennessee’s abundance of talent has not gone unnoticed as the squad was selected 25th in the United Soccer Coaches preseason poll. The Volunteers were predicted to finish third in the SEC.